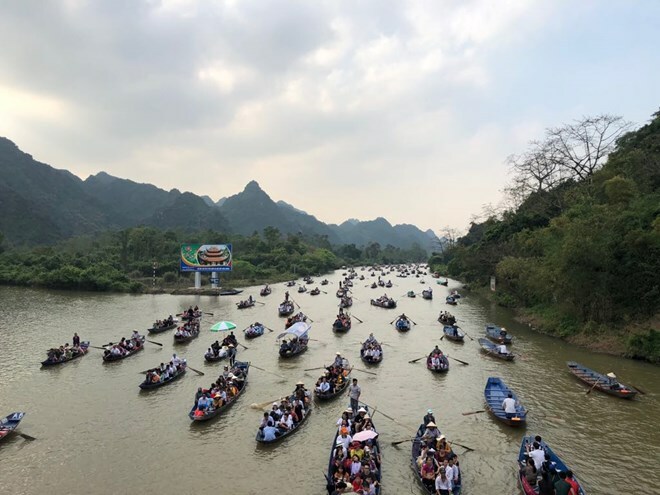 Hanoi (VNA) – Huong Pagoda Festival, the longest of its kind in Vietnam, has welcomed over 1 million visitors so far this year, according to the organising board. Visiting Huong Pagoda complex during the festival is a spiritual journey to the Buddhist Land – where the Goddess of Mercy leads a religious life. Visitors have sightseeing trips to pagodas, temples and caves which are the main attractions, and join ceremonies to ask for favours from Lord Buddha. Aside from its religious significance, the complex also holds special values in terms of ecosystem, landscape, architecture and history. The Huong Son complex was listed among national special relic sites in December 2017. It draws millions of visitors every year. The complex was built under the reign of King Le Thanh Tong (1442 – 1497). It was destroyed by French colonialists but has been rebuilt with the support of the State, local residents and visitors.